Monkshood is a perennial, hardy plant, native to mountainous regions and uplands of Western and Central Europe. It grows up to 1,50 m tall and is characterized by a strong stem, dark green, deeply indented foliage and most prominently, deep-blue, helmet-shaped flowers. Monkshood blooms from August to September. The shape of the flowers is adopted to bumblebees, which are strong enough and possess long enough probosces to reach the bottom of the flower. Aconitum napellus featured in medieval monastery gardens. arsenic” and in antiquity it was known as scorpio and thelyphonon. Another name is Wolfsbane, which may come from its use in wolf baits. 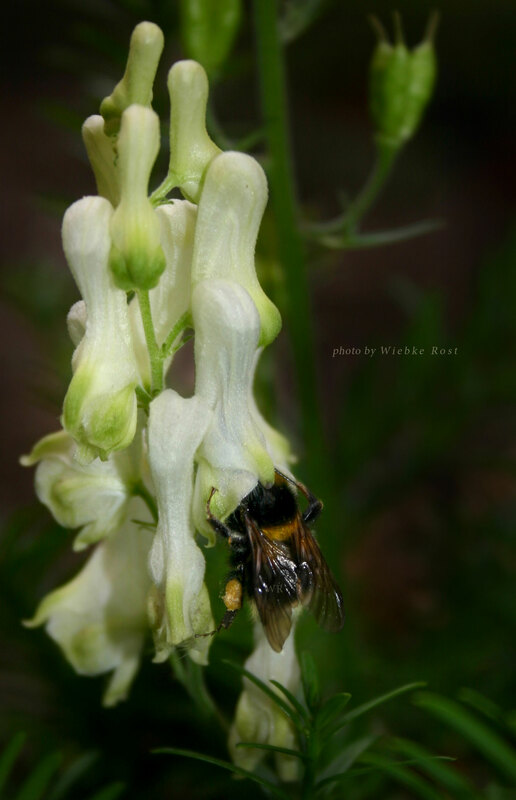 The name also applies to the yellow or white flowering Aconitum lycoctonum. 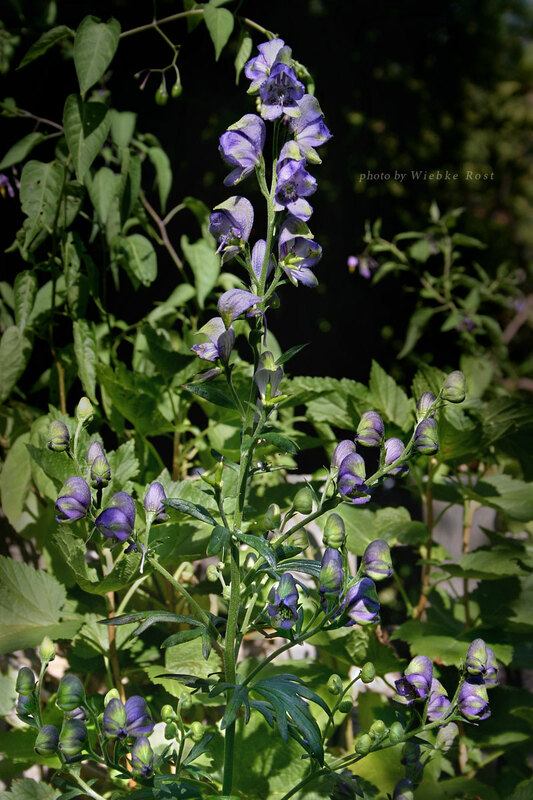 Monkshood toxicity: All members in the aconite family contain a number of toxic alkaloids. Ingesting only small amounts of any part of the plant can lead to death through respiratory paralysis and cardiac arrest. It should never be ingested. Gloves are recommended when handling any part of the plant. Monkshood propagation by seed: Monkshood is a cold germinator. The seeds are best sown fresh in autumn. Or stratify the seeds in the fridge. The seeds are dormant and require the change of temperature from cold to warm. This is their signal to germinate. In nature this happens stimulated by the warming rays of the sun and snow melt. I cultivate Monkshood seedlings in pots, using a soil mix consisting of sowing compost from the garden center and normal garden soil, which contains some loam. In late spring the young plants can be transplanted to the ground. Monkshood plants favor a mildly calciferous and humus-rich soil and a place in half shade. Best is beneath trees, where the sun light permeates. Monkshood propagation by root: Divide the root by separating young roots and planting them in fresh soil. Cover the small roots ca. 2 cm thick with soil. New plants will show up int he following spring. Monkshood in the garden: Monkshood likes a place under trees, where the sunlight permeates. The soil should be mildly calciferous. The shadier the spot and the moister the soil, the smaller the flowers. Single plants can become very old, up to 50 years. Flowering may be impaired after some years. To avoid this, dig up the root, separate the younger roots and plant them anew. Cover ca. 2 cm thick with soil. Manure with compost soil in spring. Known diseases: Monkshood is prone to root rot (caused by fungi), if the soil is too moist. It should therefore not be exposed to water logging. A clear sign is if the leaves start turning yellow and wither in the middle of the flowering season.